Two current students and one alumnus of City University London have swept the board at The Times Law Awards essay competition held in association with One Essex Court. It is the fifth year in a row that a student from The City Law School has won the competition. Prizes totaling £10,500 were handed out by the Lord Chancellor Chris Grayling during a gala dinner at Lincoln's Inn attended by more than 300 eminent lawyers and judges. The essay title, 'Morality versus legality: when is war justified? ', attracted more than 200 entries. "I particularly enjoyed the problem of trying to determine the precise meaning and effect of historical laws and I realised that these same problems resonated in modern law. I hope to practise at the Bar." "A friend of mine is currently doing a young entrepreneurs course and some of his ideas are great - I was thinking of offering him start-up funds for some of his projects. Apart from that I will probably put the money towards travelling next summer." The third prize of £1,500 went to Lara Hassell who is currently undertaking the Bar Professional Training Course at The City Law School. Lara also claimed second place in last year's competition. "I previously undertook a BA in History at the University of Cambridge and the GDL at City University London. I anticipate taking a gap year between the end of my course and the start of pupillage, and will therefore use any prize money to fund my travel dreams. I would particularly like to do some legal volunteering work in Africa." 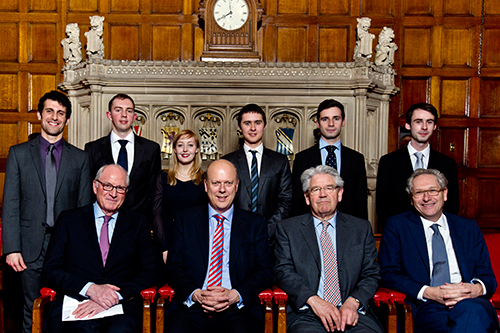 Students from The City Law School have now won The Times Law Award eight times during the past decade. The 2014 winning essay written by George White has been published in The Times print edition while the articles written by James Beeton and Lara Hassell are available to read on The Times website.